Area residents will find out why more than 60 million people all around the world have fallen in love with the characters, the story and the music that make Mamma Mia! the ultimate feel-good musical, when it opens in Curtain Call’s Kweskin Theatre in Stamford, on September 14. For those looking for something extra special, a preview performance of Mamma Mia on September 13, will include a pre-show party featuring fabulous food from Nikki Glekas Events, wine, beer and a signature cocktail. After the show, audience members are welcome to meet the cast and crew and enjoy desserts courtesy of DiMare Pastry shop. Tickets for this VIP fundraising event are $75.00 per person. Directing Mamma Mia is veteran Curtain Call director, Tom Coppola, whose last production was the sold out production of Gypsy. "I love working with Tom and so do all the actors - he really puts on a great show, AND he's a terrific performer himself," Ursone said. He is joined on the creative team by Caitlin Roberts – choreographer, Peter Randazzo – music director, Peter Barbieri, Jr – set design, Peter Petrino – lighting design, and Terry Hanson – costume design. Stage management is handled by Amy Ayala, Tommy DeSalvo, Joey Macari and Jan Ursone. The cast of 28 features many former Curtain Call performers along with many making their debut with this Stamford company. 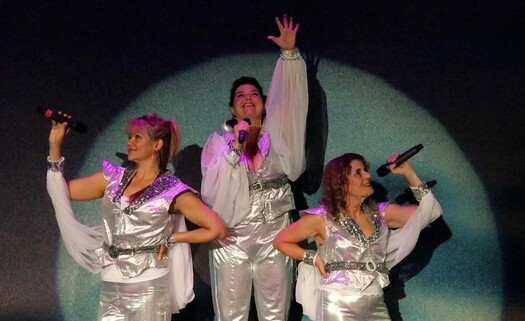 The three leading ladies of Mamma Mia, Donna, Tanya and Rosie, will be played by Juliette Koch, Gillian Bailey and Tracy Marble, respectively. Others in the cast include: William Armstrong, Rebecca Borowik, Hunter Brady, John Capasso, Alanna Delgado, Natasha Fenster, Robert Geils, Robert Thomas Halliwell, Angela Jackson, Claire Kenny, Kevin Kiley, Savannah Belle Miller, Chris Nardi, Kelly Nayden, Zully Ramos, Emma Sawch, Tyler Small, John Royse, Fred Rueck, Gregorio Santa, Nora Watson, Virgil Watson, Shayla Williams, Katelyn Wilson and Gail Yudain. Performances will be held Thursday, Friday and Saturday evenings at 8:00PM and Sunday afternoons at 2:00PM, beginning September 14. The Kweskin Theatre is located at The Sterling Farms Theatre Complex, 1349 Newfield Avenue, Stamford, CT. Tickets are $35 for adults, $25 for senior citizens and $17.5 for children. Thrifty Thursday tickets are $27.50. Box Office: 203-461-6358 x 36 or on the web at www.curtaincallinc.com. Curtain Call's 28th season also includes The Foreigner, Accomplice, Elf the Musical, A Merry Mulberry Street Musical, and many more full-scale productions, as well as concerts, comedy nights, and interactive murder mysteries. Additional information is available at www.curtaincallinc.com or by calling 203-329-8207.